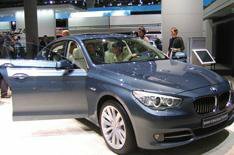 Frankfurt motor show 2009: BMW round-up | What Car? What else does BMW have at the show? There's the genre-defying 5 Series Gran Turismo, new engines for the 1 Series Coupe and the new 740d. The production version of BMW's 5 Series Gran Turismo is on show at Frankfurt and it's all but identical to the concept car unveiled at the Geneva motor show earlier this year. Different wheels and door mirrors are the only significant changes. If you thought the X6 defied categorisation, the 5 Series Gran Turismo goes at least one step further. There are elements of coupe, luxury saloon, SUV and hatchback in the mix. Four- or five-seat versions will be available, depending on trim, but both havethe same distinctive tailgate. It's a similar system to that used by the latest Skoda Superb, where a smaller section opens in the same way as a conventional saloon, or the whole tailgate lifts, hatchback-style. BMW will launch the car with a choice of three engines: the 530d has a 242bhp 3.0-litre diesel engine, the 535i has a 302bhp turbocharged 3.0-litre petrol engine and the 550i has a 4.4-litre V8 petrol engine with 401bhp. All versions come with BMW's new eight-speed automatic gearbox and have some of BMW's Efficient Dynamics systems to keep fuel consumption and CO2 emissions as low as possible. Standard equipment is lavish and includes leather upholstery, four-zone climate control, a panoramic sunroof, heated front seats and metallic paint for all models. You can expect the Gran Turismo's engines and much of its interior trim to feature on the all-new 5 Series saloon, which goes on sale next year. The 740d is also on display at the show. The new twin-turbo version of the 3.0-litre diesel engine packs some impressive figures - 301bhp, 444lb ft of torque, almost 41mpg and CO2 emissions low enough to put the car in the 27% company car tax band. There's also the new 118d Coupe, which combines low running costs with two-door coupe style. The 5 Series Gran Turismo is on sale now, with prices starting at 41,150. The 740d starts at 60,265, while the 118d Coupe is a mite more affordable, kicking off at 20,500.